In 2018 it is expected that the 10,000 transactions will be exceeded, although they are still a long way from the figures of 2007, when all the records were broken with just over 17,700 sales. However, although the figures are optimistic, they also serve as an argument for promoters to reject a strong impact of Brexit on transactions. On one hand, it is true that the purchase of homes by British people is at levels of more than a decade ago. However, unlike what happened before 2014, British buyers now acquire many more previously owned homes, rather than new construction, as can be seen in the graph above. A change in trend that coincided with the start of the real estate recovery in Spain and the upward price boom. And this is a trend that is repeated with the rest of nationalities. In such a way that, although globally the news are positive from foreigners in general, and British in particular continue to buy houses in Spain, the vast majority are resale houses. Undoubtedly, this is bad news for the promoter sector that has been launched on the coast for the last two years. High prices and lack of product. Why this change of trend? During the hardest years of the crisis, the abrupt fall in prices allowed many foreigners to buy a new house in Spain at reduced prices. Many of these houses were in the hands of the bank that decided to give them exit through sharp price reductions. As of 2014, however, there was a turning point. House prices began to rise in many locations. According to data from Tinsa, prices have increased almost 20% from their lowest during the crash. The strong increases experienced and the lack of supply have caused that demand has opted for the resale product. A situation that is observed throughout the country, where resales account for eight out of ten transactions. 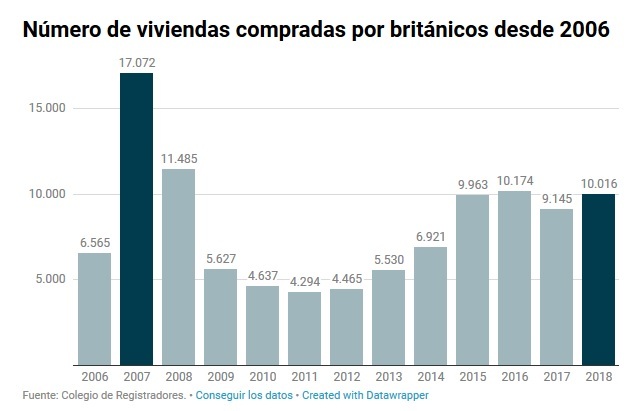 On the other hand, the weight of the British in the group of foreigners who buy a house in Spain has also been significantly reduced. 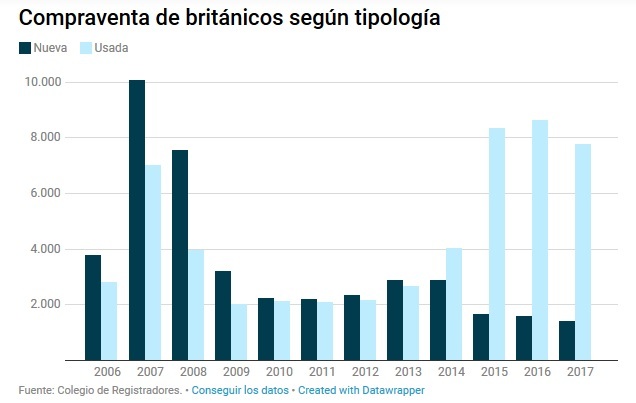 As can be seen in the graph, in 2008, the British came to monopolize almost 40% of the operations carried out by foreigners in Spain. 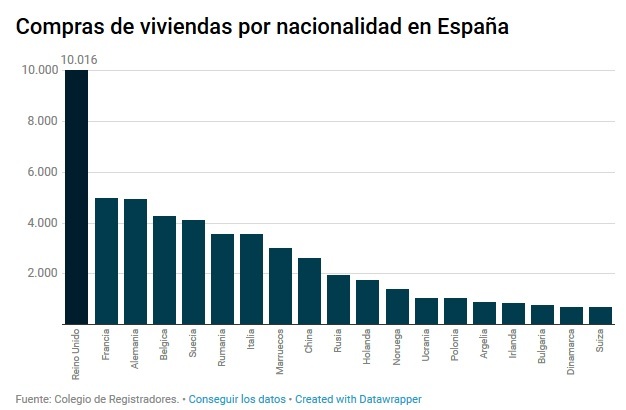 Currently, this percentage is only 15%, although it is still the nationality that acquires more homes Spain, far ahead of French and Germans. Neither Germans nor French together buy as many houses in Spain as the British so, if, as the International Monetary Fund (IMF) says, housing prices evolve in unison in the different countries and major cities of the world.